Ball Regular Mouth jars are available in 4 styles: Quarts, Smooth Quarts, Pints and Half Pints. All quilted jars in a separate category also take regular mouth lids. The regular mouth denotes the size of the mouth opening: the lid is a 70mm continuous thread size. These jars are compatible with daisy lids, our single one piece silver lids and all other accessories designed for regular mouth jars. The regular mouth pint is a popular choice for preserving, having a capacity similar to that of a standard can of food. The jars are also popular for drinking and smoothies. Regular mouth jars of pint size and larger have rounded shoulders and so are unsuitable for freezing. All regular mouth jars have embossing on all parts of the jar and there is no room on the side of the jar for a label. Standard jars are clear glass. The heritage edition pint jars are currently only available in blue, with green pints due for release in 2014. Ball Regular Mouth Half Pint Jars: case of 12 bottlesCapacity: Half pint = 8oz = 240ml Size: 100mm high, 70mm wide Mouth size: 70mm Regular Mouth Case size: 12Suggested uses: chutneys, jams, pickles, small drinking glass, floral displays, candle makingSuitable treatment methods: dry storage, vacuum seal, fermenting, water bath, pressure can, freezeBall jars cannot be baked or used in a microwave.Each jar comes complete with 2 part lid consisting of a flat disk incorporating a seal (the lid) and a twist on ring to hold the lid in place for processing (the band). ..
Ball Regular Mouth Pint (440ml) Glass Preserving Jars Case of 12Capacity: Pint = 16oz = 440ml Size: 130mm high Mouth size: 70mm Regular Mouth Case size: 12Suggested uses: food preserving, drinking jar, floral arrangements, glass storage, jams, pickles, chutneys, candle making, light holdersSuitable treatment methods: dry storage, vacuum seal, fermenting, water bath, pressure canEach jar comes complete with 2 part lid consisting of a flat disk incorporating a seal (the lid) and a twist on ring to hold the lid in place for processing (the band).Lids are recommended..
Capacity: Quart = 32oz = 950ml Size: 170mm high Mouth size: 70mm Regular Mouth Case size: 12Suggested uses: juices, fermented foods, cocktail shakers, food preserving, glass storage, flower arrangements, candle makingSuitable treatment methods: dry storage, vacuum seal, fermenting, water bath, pressure canEach jar comes complete with 2 part lid consisting of a flat disk incorporating a seal (the lid) and a twist on ring to hold the lid in place for processing (the band).Lids are recommended for single use only if the jar is heat processed using a water bath or pressure ..
4 x Ball Collection Elite Blue Jars - Regular Mouth Half Pint. 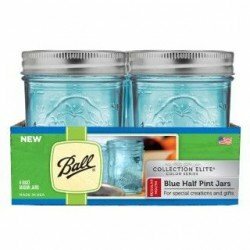 4 x Ball Collection Elite Blue Jars - Regular Mouth Half Pint / 8oz By popular demand! Due to the overwhelming popularity of the heritage blue pints released in 2013, Ball has now expanded its product line to include blue jars in a range of shapes and sizes!The regular mouth half pints are approximately 240ml and are a popular size for jams, salsas and jellies.Flower posies also look fabulous in these blue coloured jars. The jars come in a box of 4 with the standard Ball 2 piece lid and as the colour is in the glass and not painted on, the jars can be used for all your favourite preser..
Capacity: Half pint = 8oz = 240ml Size: 100mm high, 70mm wideMouth size: 70mm Regular MouthCase size: 6Suggested uses: chutneys, jams, pickles, small drinking glass, floral displays, candle makingSuitable treatment methods: dry storage, vacuum seal, fermenting, water bath, pressure can, freezeBall jars cannot be baked or used in a microwave buy Weck jars instead.Each jar comes complete with 2 part lid consisting of a flat disk incorporating a seal (the lid) and a twist on ring to hold the lid in place for processing (the band).Lids are recommended for single .. 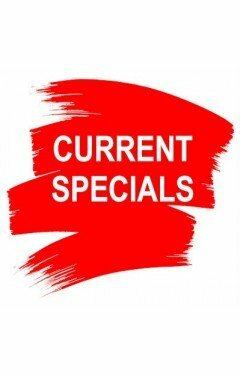 Regular mouth quart jars are 32oz which is approximately equivalent to 950ml.Suggested uses: juices, fermented foods, cocktail shakers, food preserving, glass storage, flower arrangements, candle makingSuitable treatment methods: dry storage, vacuum seal, fermenting, water bath, pressure canEach jar comes complete with 2 part lid consisting of a flat disk incorporating a seal (the lid) and a twist on ring to hold the lid in place for processing (the band). Lids and bands are regular mouth, 70mm, size.Lids are recommended for single use only if the jar is heat processed us..